Millions of Americans are affected by sinus infections, nasal obstruction and allergies. These disorders have a significant impact on quality of life and account for many days of loss productivity and time off from work. 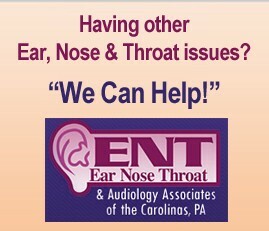 At Carolina Sinus Center, we are here to help. Dr. Williams is the founder of Carolina Sinus Center and has a broad range of experience and expertise in the medical and surgical treatment of allergy and sinus disorders. She also specializes in in-office balloon sinus dilation, a minimally invasive procedure that offers lasting relief to patient suffering from sinusitis. Several patients have experienced relief with sinuplasty and other sinusitis treatments and procedures. Read some of their testimonials..
BSD is a minimally invasive in-office procedure with a quick recovery time and lasting relief. It is a safe alternative to traditional sinus surgery. "I just want to say thank you to MBMH Gaffney for such great care and professionalism yesterday with Zoe's surgery. Every staff member we encountered during her stay were nothing but wonderful. Dr Williams is fantastic and took time to make Zoe comfortable and Devin and I comfortable"